I have had a busy day but did get a little bit of purple out to work on. I added a few rounds to my 'Round About' project. I may still add to it later this month. I found this pink and purple strip set in a scrap bin and I just had to added as my transition piece between colours. How lucky was that? I must show you the wall of Pink. 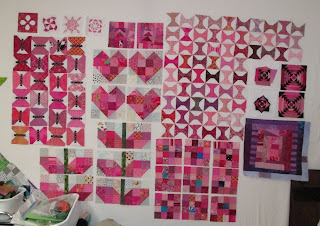 I finished up the pink this week except the two Pineapple log cabins. I have a few more sprouts, 16 patches and spools added to the pile of blocks. I am impressed with how much I have done. I am not sure I can keep it up every month, we will see. I have added this post to Soscrappy, As she hosts a linky party for the Rainbow Scrappy Challenge 2013. 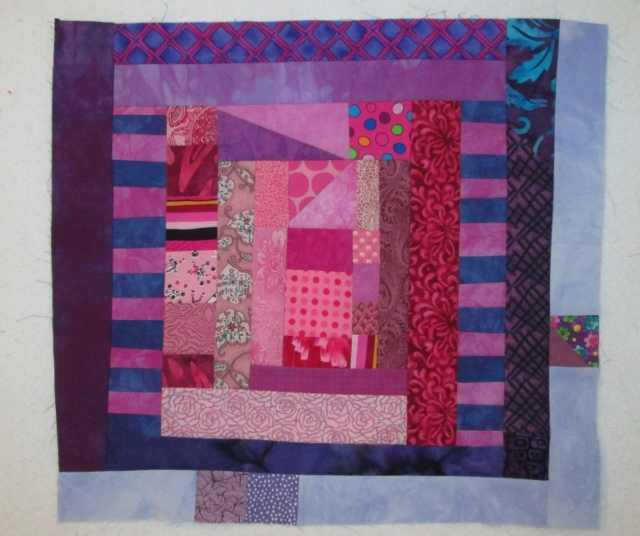 You can join us any time and linky up your purple scrap projects this month. I have to show you what I did yesterday. My fiber group meet up Friday and we worked on Crazy felt. We used water soluble interfacing on the top and bottom. In the middle we placed fiber and then stitched and stitched to hold it all together. I used many old dollies cream and white, I also used five or six different yarns and placed then in a spiral. I think I am ready to wet it all down and wash out the stabilizer. It should be good for a light weight scarf. I will show off the finished project later in the week. I love your wall of pink and can't wait to see what you make in purple! I love your wall of pink! Cool blocks. I will enjoy seeing what you do with purple. Oops. Forgot to mention your scarf project. I look forward to seeing your finished project!!! The wall of pink is amazing - always so much inspiration from you! Also, can't wait to see the result of your fiber project. It looks intriguing! What an awesome wall of pink. Hope purple is just as productive for you. I am so tempted by those sprout blocks, but I am resisting. Ooo your pink wall looks amazing. You have been busy! That wall of pink looks great. 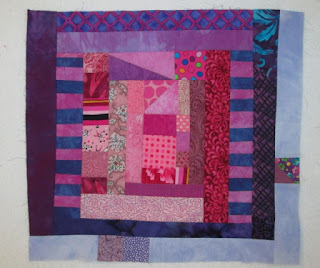 I am goin to slowly cover my pink with the purple as I make the blocks. I too have lots going on. Love the round about. 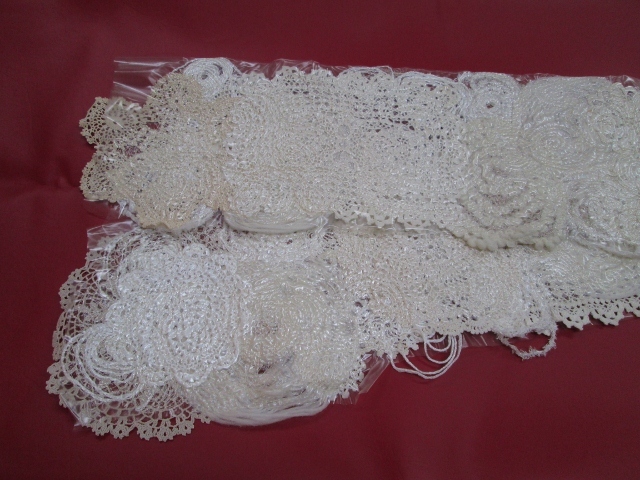 And your doilies.......can't wait to see how it turns out. January was a busy month for you! I love the butterflies and the hearts. Your wall of pink is beautiful! Love it! What a wonderful wall of pink inspiration...sooo great! Round About project--great so far. Love your pink wall. It looks like you have some great foundation pieces for a quilt already! Can't wait to see your scarf. Oh the round about was cool. I thought log cabin. What a cool idea to add a pieced block like that to a log cabin. Hmmm. I came by from the Purple challenge. It was nice to meet you. My gosh look at that pretty wall of pink! So many wonderful projects you started last month. Looking forward to seeing some of them in purple. Looking forward to seeing how the scarf turns out. It looks like it will be pretty.